If Burnley’s task was already tough, the challenge now is almost insurmountable. This defeat, courtesy of Mark Noble’s penalty and Michael Duff’s controversial sending off, leaves Sean Dyche’s side eight points adrift of 17th-placed Leicester with nine points to play for. The Championship trapdoor is gaping. Their fans still applauded at the final whistle here but the sun is slowly setting on Burnley’s season in the Premier League. That said, there was certainly a sense of injustice in the air following this result, with the referee Jon Moss – who will officiate at the FA Cup final – at the centre of the storm. Moss awarded a penalty in the 23rd minute after Duff’s clumsy challenge on Cheikhou Kouyaté. A correct decision, but there was an audible gasp inside the ground when he then produced a red card, given the covering defenders in place. Duff trudged off to the dismay of his team-mates and manager, who were hit with a triple-whammy of punishments. The game was West Ham’s from thereon and, in fairness, they performed effectively to dominate opponents who continued to work tirelessly. That was little consolation to Dyche, who claimed everyone in the stadium was surprised at the sending off. “It’s a penalty, I’m amazed it’s a sending off and wholeheartedly disappointed it was a sending off,” Dyche said. “I think there was a stadium full of people that were amazed it was a sending off. The staff were surprised it was a sending off. The subs were surprised it was a sending off. I think the groundsman was surprised it was a sending off. I think the linesmen were surprised it was a sending off. There was a tube station nearby where they were surprised it was a sending off. But other than that. Things almost began disastrously for Burnley when Aaron Cresswell broke down the left in the opening minutes. The full-back delivered a dangerous low ball across goal where Enner Valencia was well placed, but the onrushing striker could not make any contact. It was an early scare but Burnley should have been ahead soon after when Danny Ings, who has not scored since February, spurned a glorious opportunity on the edge of the six-yard box. Matt Taylor found space down the left flank and picked out Ings with a fine cross but his header flew over. Six minutes later Burnley were a man and a goal down. Valencia controlled well down the West Ham left, cut inside and slid a neat ball in front of Kouyaté. He touched it inside but Duff took his legs away with a clumsy challenge and Moss awarded the penalty. 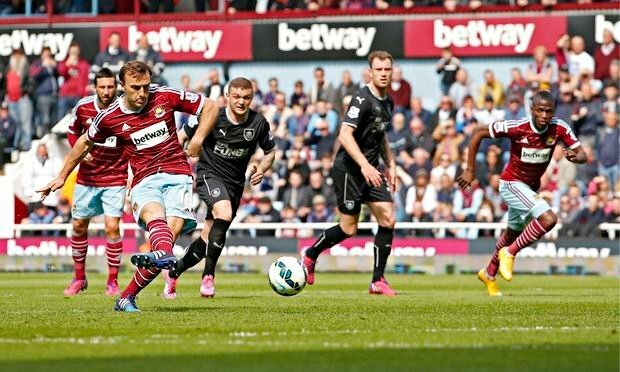 Noble coolly slotted home. Had it not been for their goalkeeper, Tom Heaton, Dyche’s side would have been further behind before half-time. A swift break found Stewart Downing in space down the right. He pulled the ball back for Valencia but his quickfire shot was palmed brilliantly over the crossbar by Heaton. The goalkeeper was called on again soon after to deny Morgan Amalfitano from a tight angle. Burnley continued to fight after half-time, and Ings perhaps should have done better after a break down the right, cutting inside and hitting a shot into the side netting when he had options in the middle. They did, however, come close in the 58th minute when Taylor’s smart effort on the turn from inside the penalty area was saved by Adrián. It came in the midst of a frantic spell. From one end to the other, Cresswell pulled the ball back for Nolan to shoot first-time from 20 yards. Heaton saved and the rebound trickled across goal and wide, before Downing was booked for diving. West Ham peppered their opponents’ goal in the closing stages and, although they could not break through, Allardyce’s side move to ninth in the table.